Previous Post Spring Cleaning Blog Sale! How fun! You look so cute in that photo stitching away! Wow, that sounds like an awesome opportunity! What will you be sewing while there? good for you! You will be wonderful at it. Aww, thank you so much, Nancy! 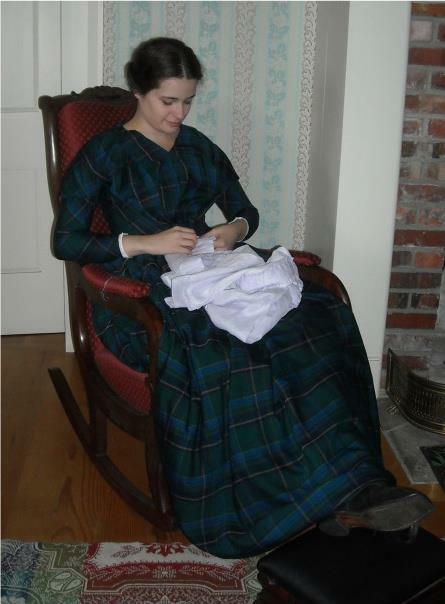 Well, today I worked on an 1860s dress for a client, and did some work on my 1850s straw bonnet. I’ll likely work on both projects again tomorrow, as the steady stream of visitors means that I’m not getting a whole lot of sewing time. But it should be less busy tomorrow! And thanks for stumbling upon my blog! You have some really lovely sewn items on your blog.